Australian shipbuilder Austal has launched the first in a series of 10 fast patrol boats being built for the Republic of Yemen. 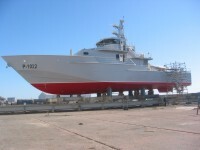 The 37.5 metre deep V monohulls are a simplified version of the Bay Class patrol boats delivered to the Australian Customs Service in 1999/2000 and have been tailored to the customer's operating and budgetary requirements. Powered by twin 1305kW Caterpillar V12 diesels they will be capable of 29 knots and have an operating range well in excess of 1000 nautical miles. Each vessel will be fitted with a 25mm twin-barrelled naval gun and two 12.7mm heavy machine guns and will carry three officers and 16 sailors. Kim Gillis, Austal Military Projects Manager, said the vessels demonstrated the benefits of applying the world-best aluminium shipbuilding philosophies and practices that have made Austal an international success in the ferry building industry to the naval market. "These patrol boats feature first class materials and equipment and have been designed and built using the techniques that have made Austal a world leader in high speed vessels," Mr Gillis said. "By using aluminium we are able to supply patrol boats that are easily driven and thus have low operating costs. Further, the combination of commercial-off-the-shelf equipment from reputable suppliers, and best practice in design, construction and engineering makes them reliable and easy to support and maintain, which reduces through-life support costs." Mr Gillis said these life-cycle cost benefits were in addition to savings in initial acquisition costs brought about by Austal’s commercial shipbuilding expertise. "Our production efficiency, and a focus on ensuring that the vessels are only as complex as their missions require, means we are able to supply patrol boats like these for significantly less than customers have come to expect to pay for high quality vessels of this size and capability," he said. Kim Gillis said the company is expecting there to be a great deal of interest in vessels of this style because they combine levels of capability, reliability and affordability not previously available in the marketplace. "Over the next few months we will be in the fortunate position of virtually always having one of these patrol boats available for inspection and on-water demonstrations at our shipyard. We encourage interested parties to take the opportunity to come to Western Australia to inspect them, and to discuss the wide range of benefits our lightweight, high speed vessels offer in defence and related applications," Mr Gillis said. Austal is on schedule to deliver the first four vessels for Yemen in June this year, with the remaining six vessels being delivered in pairs at two monthly intervals. Patrol and military vessels are currently generating a great deal of activity within Austal's shipyards. In addition to the ongoing work provided by the Yemen contract, Austal Ships will soon commence construction of the first of the Royal Australian Navy's 12 new Armidale Class patrol boats. Meanwhile three 22 metre Coast Guard vessels built by subsidiary Image Marine are currently on their way to Kuwait and the company's US shipyard has a contract to build a 31.5 metre vessel that will be used to demonstrate high-speed multihull technology to the US Office of Naval Research. The General Dynamics team that includes Austal has also recently submitted its proposal for the US Navy's Littoral Combat Ship (LCS). The team’s bid is based on Austal's high-speed trimaran hullform, a commercial variant of which is currently being built in Western Australia.